Well researched, scientifically reasoned, elegantly concise, this book will long be required reading on the ‘Star of Bethlehem’. Full of fascinating historical facts, and better informed and more careful than any other book on the subject, this should be on the shelf of everyone interested in that legendary celestial event. I added on my own blog review of the book, that Adair’s bibliography alone is of great value. Scientists will find the book especially heartwarming. Historians will as well. It even taught me a few things. 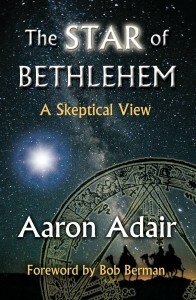 Even the foreword by astronomer and science writer Bob Berman was educational, with an example of creationists even interfering in public astronomy education, through the pretext of the Star of Bethlehem literature. So Adair’s book is much needed and will be of value to science educators. Beyond that, however, I find this book of value not just because it will teach you a lot of cool things about history and astronomy with an economy of words, nor only because it has a great bibliography and is the go-to resource now for discussing this subject, but also because in the process of addressing astrological theories of the Star account, Adair deftly demonstrates a point I had long made myself but never had the time to demonstrate: ancient astrology was so wildly inconsistent and diverse that any astrological theory of either Christian origins or biblical accounts is probably beyond any possibility of demonstrating. So for a number of reasons, this will be an essential addition to anyone’s bookshelf who is at all into any of these subjects. It contains a lot of mistakes. For instance Adair says it is impossible to say that a planet has stopped. That is true from an astronomical point of view, but if he really had done a proper research he would have found that one of the main tasks of a magi in Babylon actually was to decide when planets stopped. Further he misses that anyone could follow stars from Jerusalem to Bethlehem any time of the year. Just travel at the speed of horse gait along the ancient road Derech Beit Lehem, and you will have the same stars in front of you all the way. The road happens to bend gently westward for each step you take, so in the right speed the magi would have had Jupiter in front of them all the way from Jerusalem to Bethlehem, and arriving there they could have decided that Jupiter stopped in the morning, which actually is an omen meaning “kings will be reconciled”, which is the same as peace on earth. Further Adair thinks that Josephus has an eyewitness to the death of Herod, and thus has the right date. Adair is referring to Nicolaus of Damascus. However, Jospehus talks about Nicilaus and says “For he [Nicolaus] wrote in Herod’s lifetime, and under his reign, and so as to please him…” (Antiquities of the Jews, Book XVI, Chap. 7:1) Obviously, Nicolaus did not write after the death of Herod. On his blog Adair says that Herod was 70 when he died and 25 on an earlier point. This point was the Battle of the Nile. If Herod was 25 then and reached the age of 70, he must have died 2 or 1 BC since the battle occurred 47 BC, which is well documented since it was fought by Ceasar. Now, Josephus actually said that Herod was 15 at the time, but several people assume that this is a typos for 25, due to what Herod had achived prior to the battle and the fact that he had several children a few years later. You do realise the star made them do a dog leg? Jerusalem from the East, and then do-legging South. It beggars belief that you are defending such a shoddy thesis. I would love to see you follow a star tonight. Go do it. You could wind up in place A. You could also do it and justify having done it to end up in place B, 100 miles to the side. To indicate a house, it clearly has to be supernatural, and thus the rest of the poibts are moot at best. If you ask Adair, he will tell you that anyone following a star in a constant speed will make a curve to the west (since the earth spins to the east) unless you walk exactly with or against the direction of the earth’s spin. However, in the case of the road between Jerusalem and Bethlehem, you can stay on the road and follow the stars at the same time, if you have a speed slightly higher than walking. Concerning the horse, it is not supernatural for a horse to walk slightly faster than man. It is called the four-beat walk, which averages 6.4 kilometres per hour.